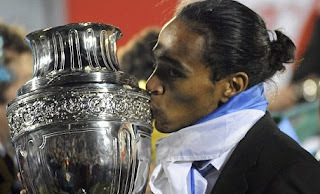 The Blues have lodged a bid of £16.6m with Porto for Uruguayan defender Alvaro Pereira, but that falls short of the buyout clause in Pereira’s contract - believed to be nearer £25m. Chelsea are expected to be holding negotiations for the next week before the transfer window closes. The 25 year old was a key member of Andre Villas-Boas’ side last season and he is first choice right back for Uruguay after they won the Copa America. Chelsea are looking to strengthen their squad and have already brought in five players so far this summer with today's completion of Juan Mata’s move from Valencia. Villas-Boas is keen to bring in another player along with Pereira and if the club cannot arrange a transfer for Luka Modric, the club will go back to Porto to try and bring in Joao Moutinho.